As the environmental impact of existing construction and building materials comes under increasing scrutiny, the search for more eco-efficient solutions has intensified. Nanotechnology offers great potential in this area and is already being widely used to great success. 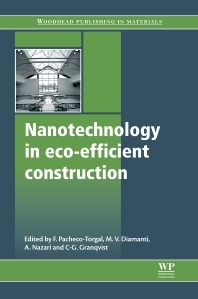 Nanotechnology in eco-efficient construction is an authoritative guide to the role of nanotechnology in the development of eco-efficient construction materials and sustainable construction. Following an introduction to the use of nanotechnology in eco-efficient construction materials, part one considers such infrastructural applications as nanoengineered cement-based materials, nanoparticles for high-performance and self-sensing concrete, and the use of nanotechnology to improve the bulk and surface properties of steel for structural applications. Nanoclay-modified asphalt mixtures and safety issues relating to nanomaterials for construction applications are also reviewed before part two goes on to discuss applications for building energy efficiency. Topics explored include thin films and nanostructured coatings, switchable glazing technology and third generation photovoltaic (PV) cells, high-performance thermal insulation materials, and silica nanogel for energy-efficient windows. Finally, photocatalytic applications are the focus of part three, which investigates nanoparticles for pollution control, self-cleaning and photosterilisation, and the role of nanotechnology in manufacturing paints and purifying water for eco-efficient buildings. Nanotechnology in eco-efficient construction is a technical guide for all those involved in the design, production and application of eco-efficient construction materials, including civil engineers, materials scientists, researchers and architects within any field of nanotechnology, eco-efficient materials or the construction industry. Civil engineers requiring an understanding of eco-efficient construction materials; Researchers and architects within any field of nanotechnology, eco-efficient materials or the construction industry.